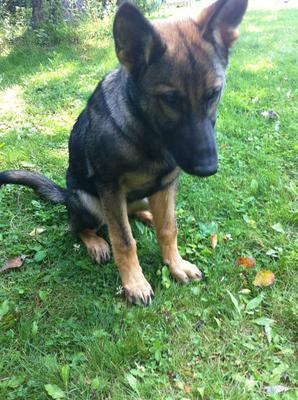 My puppy was 3 month's old when we bought her, when we first visited Northernk9.com to see the litter. we knew the little one in the back was the perfect one. She was mellow, calm but sometimes jumped around excited. The day we bought her was the day she entered her new life, and began a fun journey with us. Even when she did get in trouble, she would pout but forgive us later. We take her for walks, play with her, train her and do every such thing a dog could ever think of. Dakota is now 5 months old and very smart. Dakota always gets complimented on how cute she is when we are walking her, her dark sable fur seems to attract the attention and those big ears! She loves to play tug of war and fetch, and has a huge prey drive. Dakota does have problems when coming on command, but I am now working on that to make her the perfect dog. She loves little children, even babies. Thanks so much for sharing the story of your gorgeous sable German Shepherd puppy, Dakota, with us. She is a beautiful little girl. And the pictures show just how lovely she is. Keep her plenty of toys, lots of things that are chew worthy (and approved that way by you) and on the best dog food you can afford and she should do great. And what a beautiful set of ears too! Really nice! I wish you much luck with her. Keep us up on her progress! What a gorgeous puppy Dakota is! The puppy year is sooo important; teaching, training and bonding and especially that. At times the little one will get scolded for doing something that they shouldn't be doing but always let her know she is Loved. It is a lot of work but so much more rewarding. 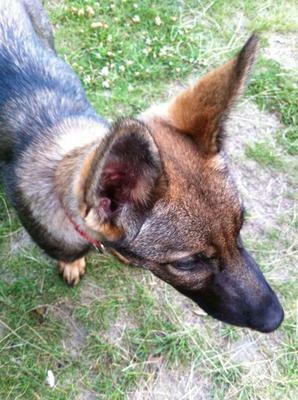 Mia beautiful German Shepherd, she was also 3 months old too when we were bless with her. We have so much fun and she loves her balls and tugging. She is Loyal, Obedient and Protective all what a German Shepherd should be! I love those big ears too! Take care of you little Angel and she will always be at your side taking care of you!